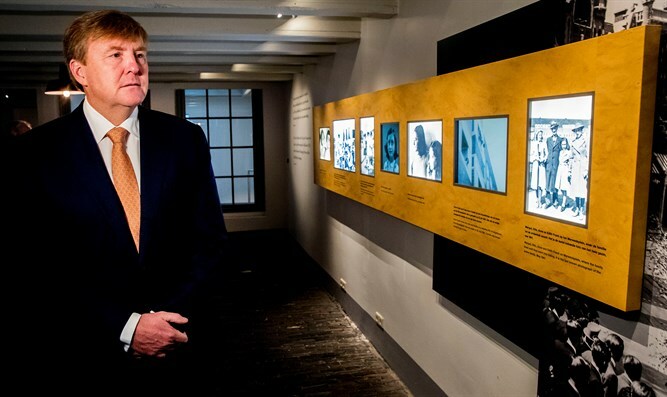 King of the Netherlands in attendance as Anne Frank House unveils new audio tour and several new displays to its collection of exhibitions. The Anne Frank House has added an audio tour and several new displays to its collection of exhibitions, JTA reports. The new elements were unveiled on Wednesday in Amsterdam in the presence of King Willem-Alexander of the Netherlands. The new displays include information and pictures about the family of Anne Frank before they went into hiding at Prinsengracht 263, the hiding place that later became the Anne Frank House museum. Anne Frank was a Jewish teenage diarist who wrote several diaries while hiding from the Nazis for approximately two years. They were discovered in 1944 and sent to concentration camps. Only Anne’s father, Otto, survived. He edited Anne’s diaries and published them in 1947. “The Diary of a Young Girl” became one of the world’s best-selling books. The Anne Frank House attracts about 1.2 million visitors annually. In the renovations, a coatroom was added to the museum. Last year, the Anne Frank House had a record number of visitors for the seventh consecutive year. In 2016, nearly 1.3 million people visited the site. “In the museum we now give more information on events in the 1930s in Germany and during the Holocaust in the Netherlands,” the museum’s spokesperson wrote in a statement. The additions cost more than $1 million provided by BankGiro Lottery and took two years to complete, noted JTA. In September, an unopened letter that was mailed to the home of Anne Frank while she and her family were in hiding fetched more than $11,000 at an auction. Bidding on the envelope, which came from an insurance company in 1942, began at $570 ahead of the auction, which took place at the Corinphila Auction House in Amstelveen south of Amsterdam. The name of the new owner was not disclosed. The envelope carries a red “return to sender” stamp and is addressed to Anne’s father, Otto Frank.